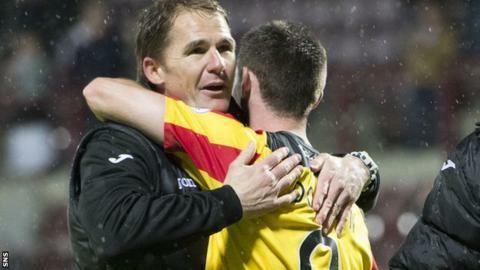 Partick Thistle manager Alan Archibald has targeted a prolonged stay in the Premiership after his side secured safety with a 4-2 win at Hearts. The Jags, who were promoted last season, came back from 2-1 down to ensure they cannot finish in the relegation play-off spot. "Hopefully, we can build on this, because for years we've been a yo-yo team," Archibald said. "It'll be difficult again next season, but hopefully we can build on it." And he added: "Teams like St Johnstone, St Mirren and Inverness are our benchmark. They've went and done it (stayed in the top-flight), so there's no reason why Partick can't, but we know it's a massive job at hand." Thistle fell behind to a Callum Paterson goal before Lyle Taylor replied, but Danny Wilson nodded Hearts in front again just before half time. Archibald's side bounced back brilliantly after the interval, though, and goals from Gary Fraser, Lee Mair and Kallum Higginbotham gave them the crucial victory. "We worked all year to get that prize and we're delighted to be there," added the Thistle manager. "We done it the hard way tonight, which we've done most of the season, but the players are a credit to themselves and the club, I thought they were fantastic. "I spoke before about pressure and the difference it makes to teams and we didn't turn up (first half), but all credit to them, what a reaction we got from the lads, they were outstanding in the second half. "It's hard to put it into words, it means a hell of a lot to all the supporters, and everyone who works at the club as well. "You see relegations and it can affect the whole club, not just the playing staff. It's every decision you've got to make, about keeping players on, staff as well. "It makes such a difference and it's massive for the club. "We've got a couple of hours off and then we kick on, we start right away. "That's why you don't want to be in those play-offs, because it takes a couple of weeks off your plans. We can go and start planning pre-season now and start looking at moving on."